We have a splendid new deal to share with you today. This deal includes five decorations for one low price. You get 2 prelighted trees, 2 pieces of 9 feet of garland and a square wreath all for the extremely low price of $139.99. This is a tremendous value on holiday related merchandise. You can add these items up individually and see that you are SAVING a HUGE amount of GREENIES when you order this Deal 012. Use all five products BOTH indoors and outdoors so your decorative options are absolutely endless. Not only do you save a ton of cash on the deal by itself, but you ALSO get FREE ground shipping right to your door. Is that great or what? The set of decorations is a perfect new home gift or why not use it to decorate a business? The products are an extremely versatile set of holiday related decorations. Don’t kick yourself later when the price is twice as much. Order now and save money. After all that is the plan isn’t? Please remember coupon codes are not eligible to be used with this offer. The $139.99 is the final price delivered to your location. Offer is only good while supplies last. Saint Patrick’s Day is so close and more people are recognizing that the holiday is fast approaching. 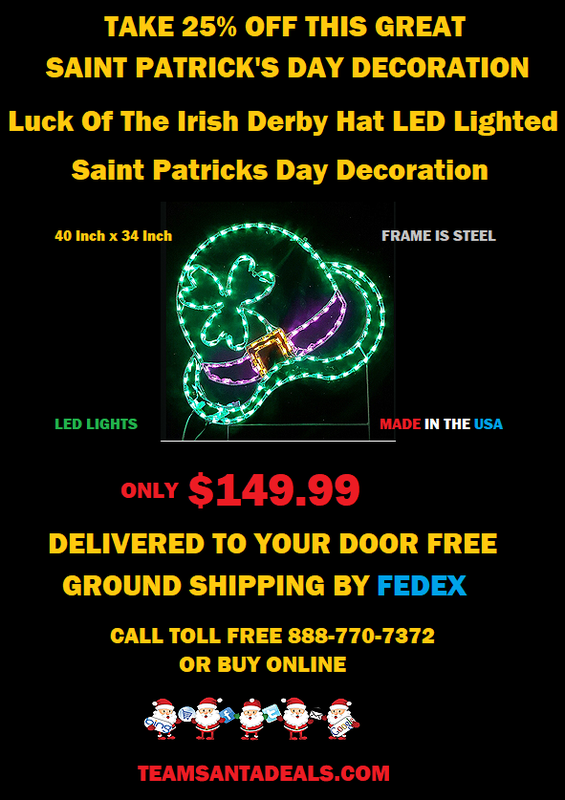 With that in mind, we would like to introduce to you, Deal 011 Luck Of The Irish Derby Hat LED Lighted Saint Patrick’s Day Decoration. Is this decoration cool or what? The frame of the hat is made of steel and it comes with green LED lights pre-installed, that display so vibrant and colorful. The LED Lighted Derby Hat decoration is a high quality decoration. Not only can you hang it but you can also stake it in the ground in front of your house or business. It’s a lovely yet versatile Saint Patrick’s Day decoration. If you order now, you will have your order next week guaranteed. Free shipping too. It’s a phenomenal savings of $50 off the everyday price of $199. Offer is good while supplies last. Offer will end on March 17, 2018. Have we got a great deal to share with you! Deal 010 is truly inspired by imminent Saint Patrick’s Day Irish celebration only a few weeks away. In celebration of this traditional Irish festivity, we have created a 7 foot LED lighted Leprechaun. What am I supposed to do with a 7 foot LED lighted Leprechaun? Do you have an Irish theme restaurant or pub that you want spice up this year? Is your business in need of a hefty dose of Irish heritage? Why not add a giant leprechaun to your Saint Patrick’s Day decorations. Our giant Leprechaun stands a massive 7 foot tall and can be used both indoors and outdoors. LED bulbs mean it hardly uses any electricity at all and the bulbs are a special Irish green to help accentuate the brilliance of this very special product. The giant Leprechaun will set you back $699 delivered to your door inside the continental USA. Free shipping via FEDEX.COM. Use this giant lighted decoration outside your restaurant standing next to your menu. How about the entrance to the local Irish pub in town. Picture a 7 foot lighted Leprechaun on the parade route. Made from high quality steel right here in the USA. You will get a product that you will be proud to show off. 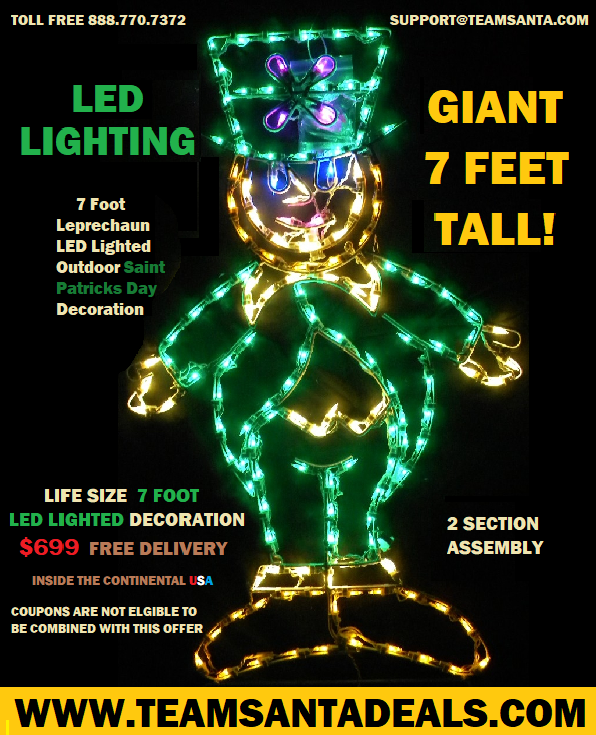 If you want to order the giant lighted Leprechaun, you will need to do it quick. We can only make a limited quantity. Before you know it Saint Patrick’s Day will be here! 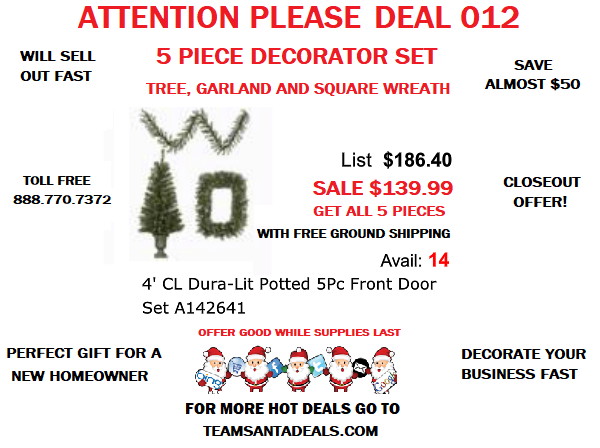 You can place your order on Teamsantadeals.com while supplies last. 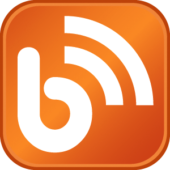 Thanks so much for taking the time to read our most recent posting on the Team Santa Inc. Blog.